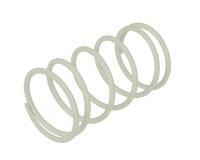 White variator adjuster spring from Malossi, Italy. Silicon-Steel spring with high carbon content, heat-treated, dynamically balanced, kiln painted and designed and calculated for each specific application. Applies to the following variators:M.5113398 and M.5114192.